Physical Exercise is one of the most effective methods to beat stress. Exercise by improving your look, your health, your self esteem can energize a person and be real stress buster. Stretching exercises, weight training and aerobic exercises like walking; running and swimming can transform your life. Regular exercise allows the body to maintain good metabolism or homeostasis and reduce the physical impact of stress. The High of Working out: Exercise increases the production of certain chemical like endorphins, which make you feel like a king. These endorphins have been shown to increase during physical activity of twenty minutes or more. Chemically they are similar to opiate compounds like morphine and can provide an analgesic or pain relieving effect, as well as and create a sense of euphoria. Some runners have experienced feelings like second wind or a boost of energy in the midst of a long run. Several other runners have actually described the feeling of a psychological boost and named it the “runner's high”. Valve to let out Anger: Exercise is a great outlet for pent up anger and hostility. A good whack to the golf ball or a series of punches to the punching bag can be a catharsis for negative energies and caustic emotions. Opportunities for Social contacts and friends: The buffering effects of friends and social support are well documented in stress reduction. Recreational activities like golf, tennis, badminton or gym training gives us the opportunity to meet like minded people and sometimes the friendships last a lifetime. Exercise improves Sleep: Stress is the enemy of sleep. Exercise has been shown to be very effective in helping some individuals fall asleep easily and sleep more soundly. Exercise ensures better quality and depth of sleep, which can energize you to face the stresses of life better. Quality time with self: Exercise allows you the luxury of spending quality time with yourself. An invigorating walk on the beach, bicycle ride in the country, swimming laps in a pool or an early morning run can be an escape from the daily toils and pressures of a stressful society. These sessions allow you to recharge your creative batteries, do some serious introspection or indulge in some motivating self talk. 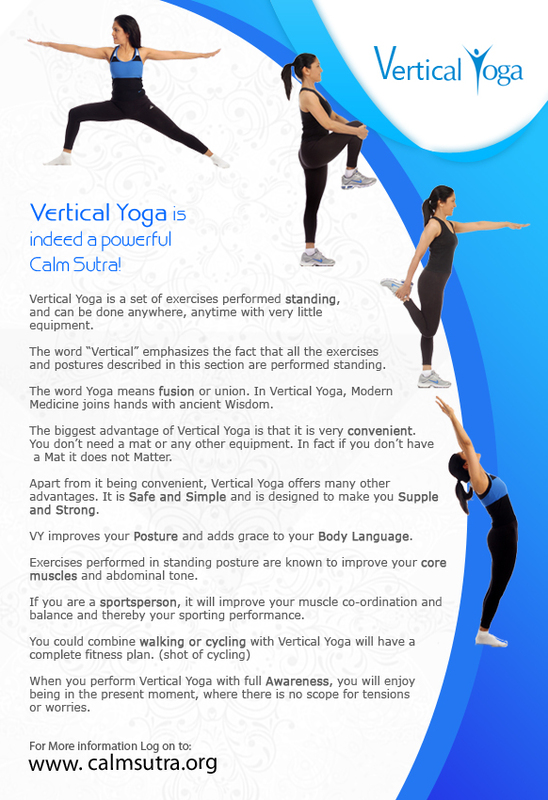 For more detailed information on Exercise you could refer to the book “Calm Sutra, the Art of Relaxation”.